This DeLand US Army tug, originally called ‘Groton’ (ST 1982), was built 1953-54 by the Olson Corporation in the US. 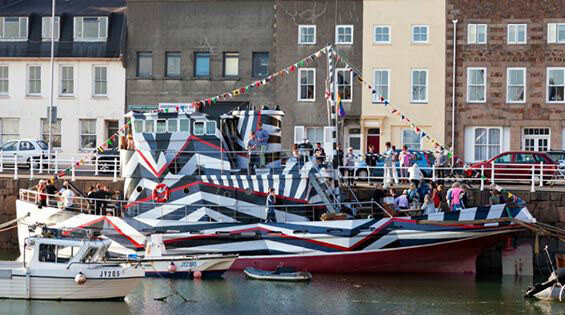 ‘Elektra’ has recently been painted in ‘Dazzle Camouflage’ in a project enabled by the Jersey Arts Trust, with funding by the Great War Fund. The project was led by Jersey artist Ian Rolls and involved artists from the Skipton Art Series. Elektra will be moving to Old Harbour to take part in the enormous Public Projection Gallery taking place at Normans, Commercial Buildings, St Helier from 10 November 2015. To tie in with the Public Gallery, author Glyn Evans will be coming to Jersey to give an illustrated talk on the Dazzle Ships of World War I, with a Q&A with Ian Rolls and Sasha Gibb. For more info, images and to book your place visit Skipton Art Series at www.arts.je and Skipton Art Series. Do you have a project you would like us to work on? Or perhaps some questions? Contact us below and we’ll be more than happy to assist you. © Antony Gibb Ltd. Brand and web design: Aviary Creative.